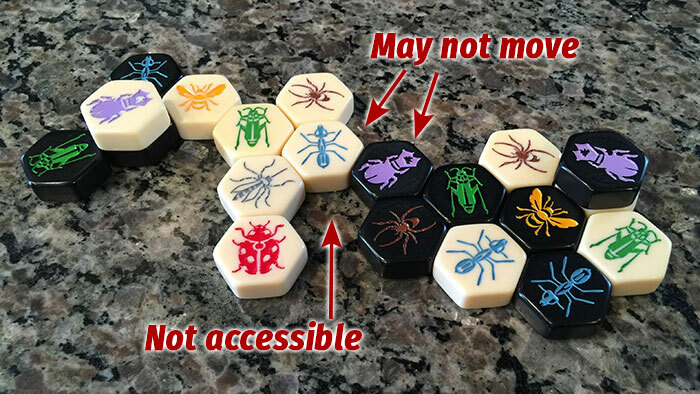 Hive by John Yianni has the same feel as chess, but instead of knights and bishops and castles the pieces are common garden insects. There is still a queen, a Queen Bee of course. 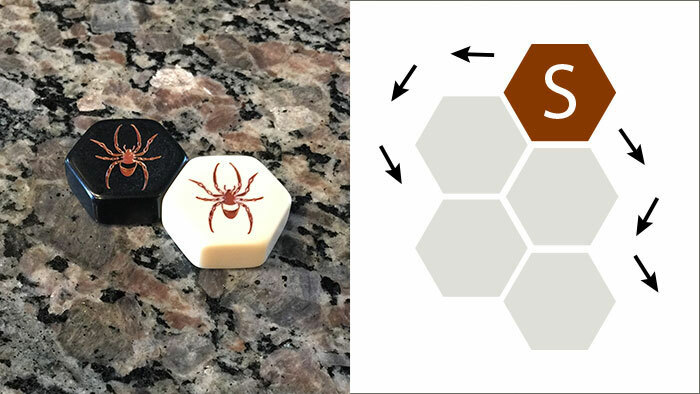 In Hive each player controls an army of bugs: ants, spiders, beetles, grasshoppers and even ladybugs and mosquitos (the latter 2 via expansions), all focused on a single task…protecting the Queen. Setting up Hive couldn’t be simpler. Each player will take all of the pieces of a one color, either white or black. Clear the tabletop and decide whether to use any of the expansion pieces, if you have them. 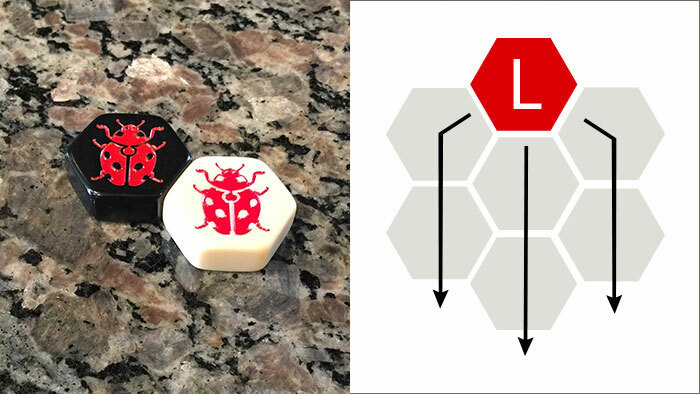 I own the mosquito/ladybug expansion and I think there’s no reason to ever play without them. Select a starting player (generally white), and play can begin. Hive is played in turns, with each player having two choices. They can play a tile from their supply, or they can move an existing tile on the board according to it’s unique movement style. The goal of the game is for one player to completely surround the opposing Queen and prevent her from moving. One Hive Rule: At no time can one piece move such that the hive splits into two separate parts. Freedom to Move Rule: Movement is accomplished by a sliding motion (except for Grasshoppers and Beetles). This means that if a piece cannot physically slide into, or out out from, a location it cannot be moved. On their first turn the starting player will select any of their tiles and place it in the center of the table. The opposing will do the same, placing their piece adjacent to the first player’s piece. For the rest of the game, any newly placed pieces must always be adjacent to one of the player’s own pieces, and may never be touching any of the opposing player’s pieces. You must place your Queen tile by the 4th turn. Play proceeds in this fashion until one player’s Queen is completely surrounded, either with their opponent’s pieces or with their own pieces. The player who surrounds their opponent’s piece is the winner. 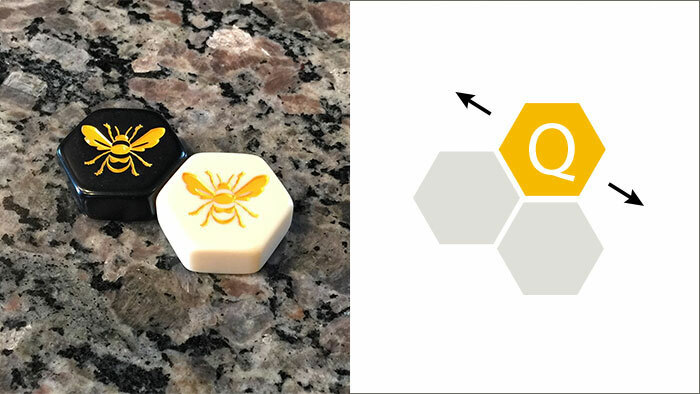 Now that you know how to play Hive, let’s take a look at the tiles you have available to you, and how each of them can move. 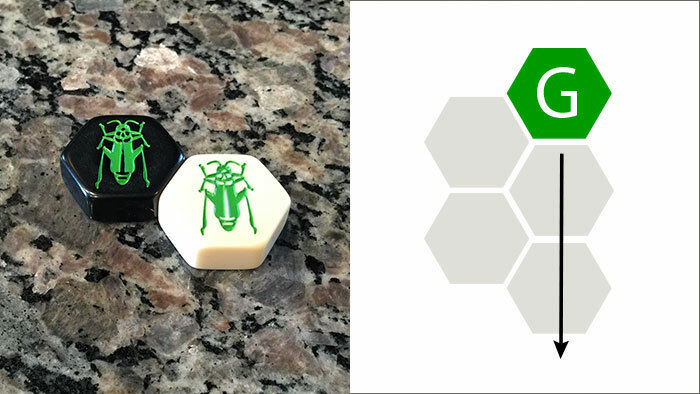 The Queen Bee tile is the primary focus of the game. Capture your opponent’s Queen and you win. Fail to protect your own Queen and you lose. The Queen is able to move any direction, one space at a time. The Soldier Ant is an extremely powerful and versatile piece, able to move any number of spaces around the outside of the hive. The Spider offers surgical precision, moving 3 spaces exactly, no more or less. The Grasshopper moves in straight lines, jumping over any number of tiles until it lands in an empty space. This means that if maneuvered properly, the Grasshopper can even drop into a space where other tiles would not be able to go. The Beetle is the muscle of the Hive. While it can only move a single space at a time, like the Queen, it has the ability to move in 3 dimensions and stop on top any other piece. When this happens the piece below the Beetle is immobilized until the Beetle moves again. Like the Grasshopper the Beetle can also move into positions not accessible to other pieces. The Ladybug is the Knight of the Hive world. She can move 3 spaces exactly, like the Spider, but can also move on top of the Hive like the Beetle. However, the Ladybug must move two spaces on top of the Hive, but then come down for the final space. 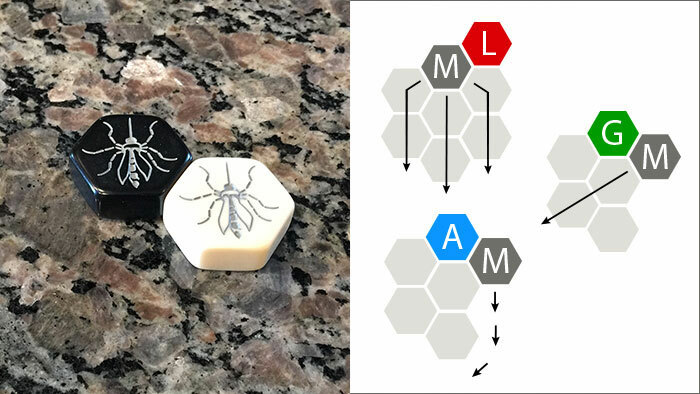 The Mosquito is perhaps the most useful piece in the game, being able to take on the movement characteristics of any piece it is currently touching, including your opponent’s pieces. When I was first introduced to Hive via Penny Arcade, many many years ago I was immediately turned off. The bizarre movements, the lack of a board, and the version I played didn’t offer any insight into it’s rules or win conditions. I wasn’t into gaming, and it was new enough that not many people were aware of it, and could guide me. Fast forward to last year when I started playing more and more games with my 10yo daughter. After hearing about it from a number of people I decided to finally pick it up. I’m glad I did. It’s such a unique game, with a blend of distinctive artwork, movements, and play style. It’s fairly fast, with games lasting 10-20 minutes, it’s thinky because you always have to balance offense and defense. It’s also different from chess because pieces are added to the board over time instead of being removed. This gives you another vector for strategy. Do you flood the board with pieces hoping for a delayed endgame, or do you add fewer move powerful pieces and go heavy on the offense. I also LOVE the quality of the pieces. You could literally soak these in water and they’d be unchanged and unharmed. Play Hive on a wet bar, play Hive at the beach, play Hive underwater. It makes no difference to the pieces. I won’t say Hive is perfect, but in all the plays I’ve had so far the only thing that bothers me is one of format. 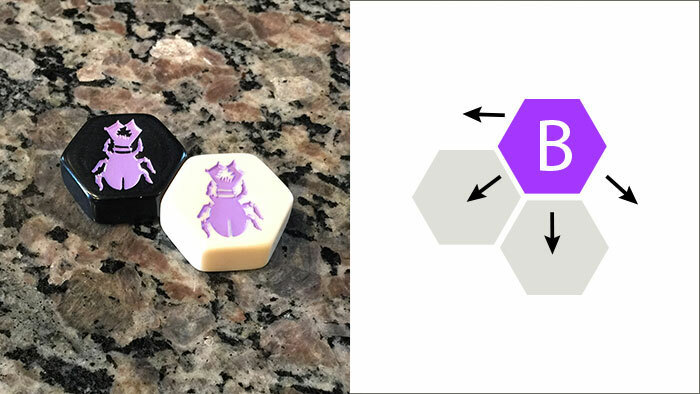 Hive comes in two sizes, the normal size pieces are almost 1.5 inches across while the Pocket size are less than an inch. This might not sound like a lot, but it’s a big difference. The pieces are lighter so they move around more easily, they’re smaller which makes them harder to manipulate. Obviously this isn’t a problem with the game per se, but it’s definitely something to be aware of. If I were to purchase Hive again, I’d go for the full sized version. It’s still pretty portable. The verdict is in. Hive is a great game. Easy to teach, a good amount of strategy, durable pieces, and it’s really fun to boot. 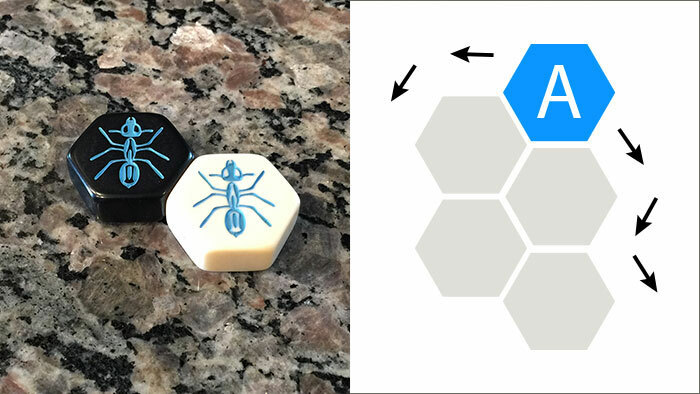 Even your friends who hate bugs will love to play Hive!